How To Make A Mayor Go Away: San Diego Weighs Filner Options : It's All Politics Embattled San Diego Mayor Bob Filner continues to cling to his office, even as the City Council and activists devise plans to oust him. Ruth Johnson (right), who supports San Diego Mayor Bob Filner, speaks with anti-Filner protester Rob Shick (left) during a rally at the San Diego Concourse on Monday. How does a city make a scandal-plagued mayor go away when he stubbornly refuses to leave? The San Diego City Council appears poised to apply what might be characterized as the Al Capone approach. Capone, as you may recall from your history books, was a notorious 1920s-era Chicago gangster whom the feds finally nailed on a tax evasion charge. In the spirit of that novel "if you can't get him on one thing, get him on another" tactic, a united City Council is reportedly exploring a scheme to force out Filner over the alleged use of city money for $1,000 in personal items and for potential issues surrounding the cost of a trip earlier this year to Paris. Meanwhile, Republican operatives and others organized a rally Sunday to draw attention to their fledgling petition drive to recall Filner, who has refused to relinquish his seat despite allegations that he sexually harassed more than a dozen women. 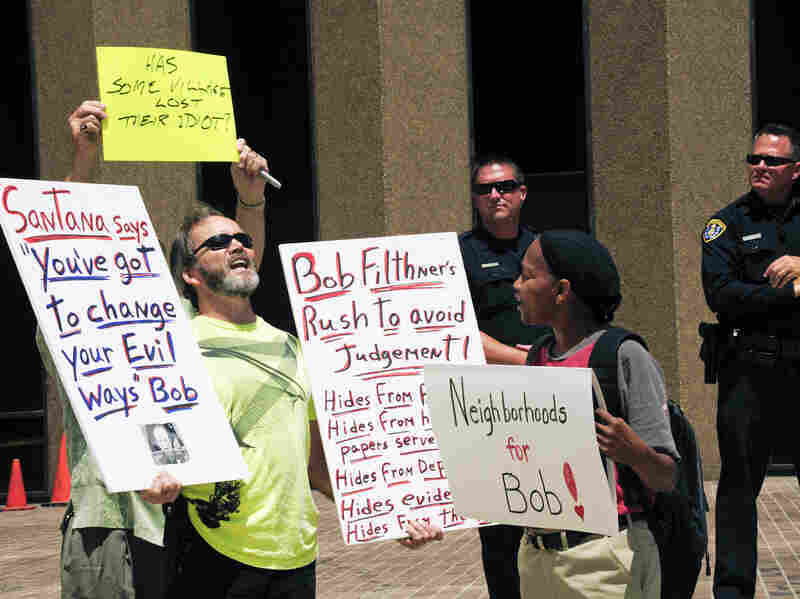 Supporters of Filner, a former congressman and the first Democrat to serve as San Diego's mayor in two decades, responded with their own gathering Monday demanding due process for the 70-year-old mayor described by one sympathetic speaker as guilty of "sloppy kisses." The women who have alleged that Filner forcibly kissed or groped them, or who were allegedly subjected to lewd comments, include a former aide, a grandmother and female members of the military who had met with him about sexual harassment in the armed services. As for Filner, who took office in December, he was a no-show at his office Monday. That was when he said he'd return after two weeks — more or less — of self-imposed time at a residential treatment center where he'd sought help for his behavioral issues. Local station KGTV reported Monday that Filner's lawyers were in a "mediation session" with City Attorney Jan Goldsmith and Gloria Allred, the high-profile, publicity-savvy lawyer who represents three women who have accused the mayor of unwanted sexual advances. Allred said Monday she represents more women yet to come forward. The Filner drama continues to draw unflattering national attention and produce strange political bedfellows: Democratic House Minority Leader Nancy Pelosi and conservative Fox News host Sean Hannity are among those who want the mayor gone. More than 80 percent of San Diego residents agree, according to a poll released Sunday. Removing a recalcitrant mayor from office, however, can be extremely difficult — particularly someone like Filner, who is strongly motivated to have the city continue to pay legal fees and damages that may rise from his alleged behavior. And who come December will be eligible for a pension bump-up. We turned to Steve Erie, a co-author of Paradise Plundered: Fiscal Crisis and Governance Failures in San Diego, to walk us through what's happening in California's second-largest city. "We were known as Enron-on-the-sea," Erie says, referring to the coastal city's enormous financial problems. "Now we're the home of Groper-by-the-sea." And though Erie says the allegations against the mayor, if true, are "absolutely reprehensible," he argues that the best out for the city is a negotiated exit agreement. "If Filner is willing to resign, if his sexual harassment fees and legal fees and damages are covered, and he gets some little boost in his pension, that would be the brightest move imaginable," Erie argues. What about the Capone strategy — ousting Filner over spending discrepancies? "That is a classic overreach," Erie says, noting that the obscure city charter provision on which the council is relying specifies that the behavior must be fraudulent. "To claim that the purchase of a pizza, a juicer and some expensive meals are fraud — well, you'd have every public official in San Diego looking over their shoulder." He says he believes that the spending discrepancy strategy is driven by deep personal and professional animus between Filner and Goldsmith, the conservative Republican city attorney. All of it is taking place in a once Republican city that is transitioning from red to blue. The recall effort against Filner faces a high bar: Those who want to oust the mayor need to gather 101,000 signatures in 39 days. And that's not the only hurdle. Erie, a political scientist at the University of California, San Diego, is among those who argue that the city's recall provision is unconstitutional. The recall provisions require that voters in a recall election also vote for a successor — language that was previously used by the state and found to be unconstitutional. Filner has "subjected San Diego to shame and ridicule," Erie says, but, as of late Monday, the mayor's face still smiled from the city's online home page, and there was no word yet out of the reported mediation session. "There is no easy path if Filner doesn't resign," Erie says. "He's got some bargaining chips."